Learning how to grow a pineapple is really a fairly simple task. If you have children, you can look at it as a fun project to do together. You'll end up with a unique, tropical houseplant, and if you are patient you can even enjoy your own fresh fruit. Starting your own pineapple plant is easy, even if you don't live in a tropical climate. They make beautiful houseplants and can even produce edible fruit. Pineapples are also easy to care for. You just need to follow a few steps to get started. First, you'll need to select one or two pineapples from the grocery store. This needs to be done carefully in order produce a healthy plant. Look for a fruit with green, healthy looking leaves. Brown leaved fruit should be rejected. Ripe fruit should be selected, but be careful not to get one that is too ripe. Pick a fruit that smells sweet and ripe. Now give one of the leaves a gentle tug. If the leaf easily detaches, this fruit is too ripe. Once you have brought your pineapples home, you should conduct a taste test. Cut the top off of one pineapple and then cut up the fruit. A pineapple corer will make this job easy but you can also use a knife. Taste some of your prepared pineapple. If you like the taste of the fruit, save the top of it to grow your own plant. Now that you have chosen one or two pineapple tops, you are ready to learn how to plant your pineapple. There are actually two different ways to do this. If you have saved two tops, you may want to try both and see what works best for you. Most growers feel that you must remove all of the fruit from the leaves. The concern is that the fruit will rot, killing the plant. Others simply leave the fruit intact and still enjoy success with their plants. Commonly, people who tell you how to grow a pineapple will say that you next will need to slice sections of the stem until you see small circles around the cut end called rootbuds. Others simply skip this step and move on to the next one. Allow your pineapple top to heal for up to seven days. This will prevent it from rotting once you plant it. Rooting can be done by putting your stem in a glass of water for several weeks. Change the water frequently during this time. You should see root growth in a few weeks. You can also root your pineapple by placing it directly into a quality, well drained potting soil. A cactus mix is an ideal choice for a pineapple to grow in. Once planted, you should water your pineapple once a week as well as misting its leaves. Do not allow it to become soggy or the roots can rot. After a year, it is best to re-pot your plant so it can continue to grow without becoming root-bound. Fertilize using a regular houseplant fertilizer once or twice a month during the spring and summer months. During the fall and winter months, once a month is sufficient. Your new plant prefers full sun for a minimum of six hours each day as well as warm temperatures of 60 to 75 degrees. While the weather is warm, you can keep your pineapple outside. Be sure to bring it back indoors before the first frost. If you live in a tropical climate, you can keep it outdoors all year round. 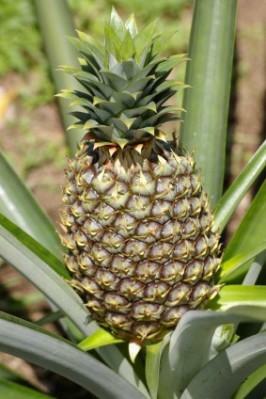 It typically takes two to three years for a pineapple to produce a fruit. You can force fruiting once your plant is about two years old. This process is best started in the winter when a pineapple normally begins this process. Place the entire pot in a plastic bag with two ripe apples for up to two weeks. Be sure to move the plant into a shaded area for that time period. The decay of the apples will release ethylene gas which will encourage the pineapple to flower. Blue flowers will form several months after you remove the bag and the apples. After all the flowers have withered and dropped, a fruit will start to form. It will require another three to six months for the fruit to begin to ripen. You'll know that your fruit is ready to harvest after the skin turns a golden color. Typically, each plant produces one fruit. Often though, a plant will also produce suckers and shoots that can be cut after the fruit has been harvested and potted to grow new plants. Allow suckers to be at least a foot long before removing them for greater success. Leaving one or two suckers on the mother plant will often produce a secondary fruit that is known as a ratoon fruit. Occasionally a third fruit can even be produced. Secondary fruits take about a year to grow. Learning how to grow a pineapple isn't difficult, but it is an exercise in patience if you want to harvest fruit from your plant. You'll see that it is worth the wait as soon as you taste your own, sweet, home-grown pineapple.